First, information about Outstanding in the Field since I haven’t talked about them for some time. 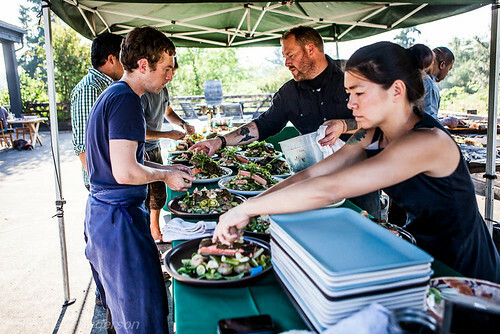 Jim Denevan, a chef and artist based in Santa Cruz, California, founded OITF in 1999 . 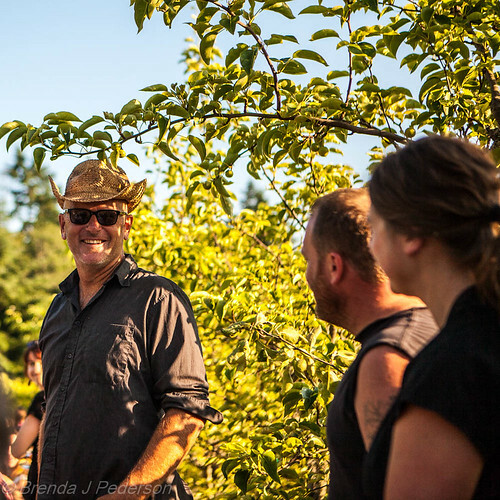 They bring together diners, chefs, vintners, farmers and other producers (foragers, fisherman, etc) to create dining events on local farms. All of the events follow the same format but each event is unique to the location and the participants involved. The largest events serve about 150 people – a few are larger and some are smaller. The diners arrive in late afternoon at the designated farm, or occasionally a beach; check-in and grab a glass of wine; then mingle while appetizers are passed through the group. After an hour or so someone from the OITF organization will formally greet the group and provide background and information about the evening. Next, the host farmer gives a tour of the farm. Then it’s to the long table for the family style meal. Groups of eight are your “family” for the evening. Throughout the dinner some of the other producers will talk a little about their work and products. 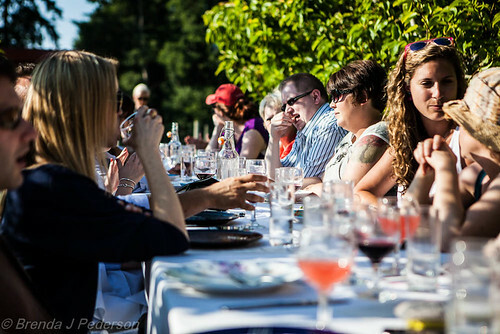 It’s been a few years since I enjoyed an Outstanding in the Field (OITF) dinner here in the Seattle area. I’ve combined my love of travel with my love of these events to attended events in other areas. 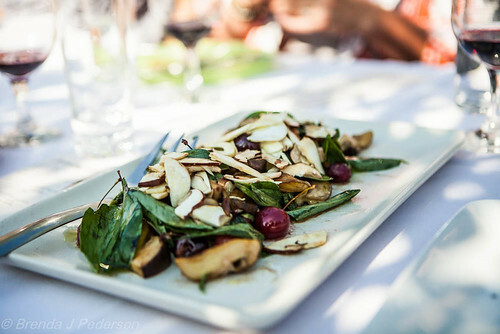 This year a dinner on Vashon Island caught my attention so four of us reserved our spot and took the short ferry ride to the island on July 10th. Summer has finally arrived in Seattle so after the morning marine layer burned off the sun came out in all its glory. We crossed sparkling blue waters, then arrived on the bucolic little island. 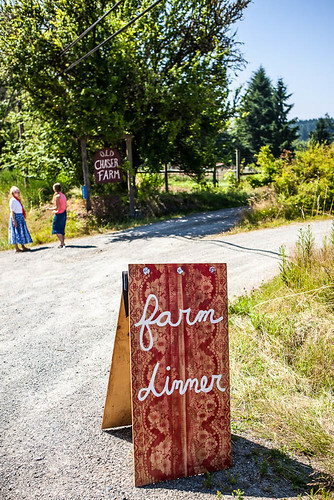 After driving through the three-block town of Vashon we arrived at Old Chaser Farm. 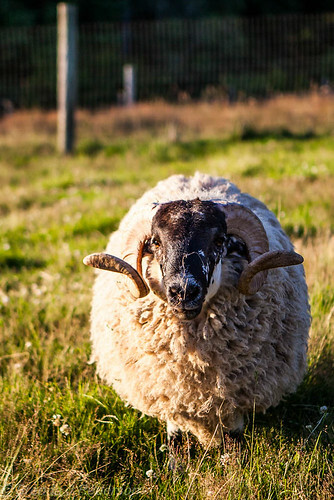 The farm is partly owned by our chef for the evening Matt Dillon of Sitka and Spruce, bar ferd’nand, and The Corson Building. There’s been a garden at The Corson Building since the beginning so I guess the next logical step for Matt was his own farm. In addition to fruits and vegetables, he raises pigs, goats, sheep and chickens here. Old Chaser offered an interesting CSA program this year (it’s sold out). In addition to the traditional vegetables and fruits, this program included bread, eggs, dairy products such as yogurt, preserves and wine. There were options for meat shares, too. This would be the type of program I’d choose if I participated in a CSA. The wines for the evening were from Syncline Winery, one of my favorite Washington wineries. James and Poppie Mantone were on site to pour their wines. Their adorable, young daughters “helped”, too! I was excited to see the rosé I recently tasted (and bought) was on the menu. If you’ve enjoyed a meal at any of Matt’s restaurants you’ll know his food is not fussy or super complex. Instead he uses great ingredients, combines and highlights them in interesting ways. That’s also how he approaches these farm dinners. Fresh fava beans in the pod, grilled and simply seasoned with sea salt became our passed appetizer. Delicious with the chilled 2011 Gruner Veltliner. After the orientation and farm tour we settled in at the table and met our dining companions for the evening. One of the things I love about the dinners is the people. I always meet someone interesting and the diversity of the diners still surprises me sometimes. On one side of our foursome were a couple and her parents who were visiting from New Hampshire, I think it was. After participating in this dinner they were keen to figure out if they could make another one somewhere back home. On the other side of us were two couples who knew each other, but unexpectedly met at the dinner. The woman closest to me was a self-professed foodie and her husband was “happy to be along for the ride”. The conversations on both sides ranged far and wide throughout the evening. There was never a dull moment. 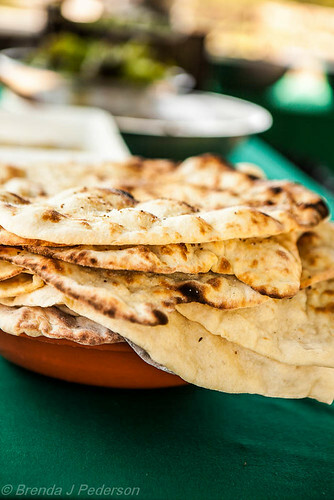 Once seated the rosé was poured and platters of freshly baked flatbread arrived. Accompanying the flatbread was a mixture of fava beans and lentils, greens, and pickled and fresh vegetables. The combination of favas and lentils was fresh and earthy. I loved that. I also could have eaten the entire stack of flatbread on my own. But I was polite and shared. The next course arrived in two parts along with the Syncline 2010 Mourvèdre. Wood-oven roasted King Boletus mushrooms mixed with cherries and smoked dried pig leg was part one. The very thinly sliced pig leg resembled a prosciutto or Serrano ham. Delicious! 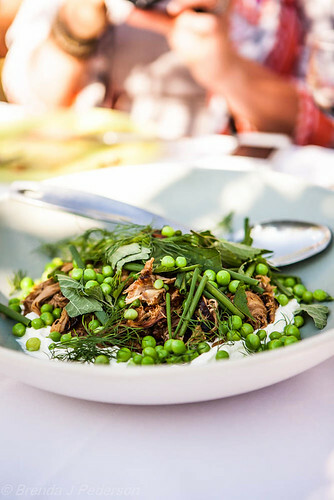 The second part of the course included whey-braised goat with yogurt, peas and herbs. This might have been my favorite part of the meal. Goat is underrated, hard to find on restaurant menus, and very succulent when properly prepared. It’s starting to make a mainstream comeback – although it has long been a staple in many ethnic diets. I really fell in love with yogurt the first time I had it at The Corson Building. Matt’s yogurt is so beautifully, rich and creamy that you crave it. At least I do. The combination of the goat and yogurt with the pop of tender peas was rich, yet light and fresh. A big winner in my book. Would any Seattle dinner be complete without some sort of seafood? Not really. King Salmon from Neah Bay was the next course to grace the table. Sides of cedar plank-grilled, grape leaf-wrapped salmon were served with new potatoes, cucumbers, green tomatoes and sorrel. The leaves kept the salmon incredibly moist. This dish challenged the goat as my favorite but I think the goat wins just because it’s not as common. The Syncline Pinot Noir served with this course is not a typical Pinot Noir, at least in my mind. The grapes come from the Washington side of the Columbia Valley, which is a novelty. Having come to wine drinking via the Pinot Noirs of the Willamette Valley where I grew up, I’m used to either the lighter, Burgundy-style Pinot or the big, bold, heady Pinot from that region. 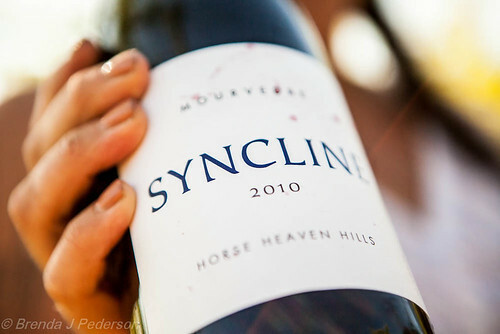 The Syncline falls somewhere between, is a little soft and has a lot of berry flavor to it. It was good with the salmon. We capped off the evening with a light dessert of milk and cookies, but not just any milk and cookies. 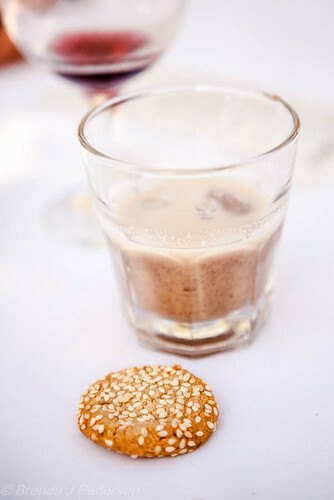 The cherry leaf, hazelnut and honey-sweetened milk reminded me a little of Frangelico with milk but without the alcohol. The base of the cookies seemed like a brown sugar shortbread and toasted sesame provided nuttiness. Some people thought this was a dessert “appetizer” expecting something a little more substantial for the finish. While it was a delicate ending, we were completely satiated and nothing more was really needed but it did feel a little incomplete. At this point a large part of the group took off to make the next ferry back to Seattle. Those of us who lingered a little longer enjoyed unexpected sips of a homemade walnut liqueur. 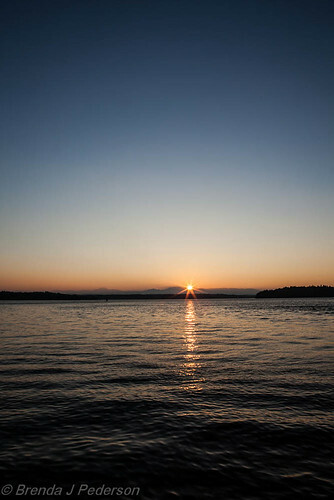 As always, I hated to see the evening end, especially on this perfect Seattle summer evening. After taking a few more photos around the farm I made my way to the ferry landing and onto the boat. I was just in time to see the sunset over the sound. Perfect ending to a gorgeous day. The OITF tour has barely started. They will be traveling around the U.S. and Canada until mid-November. While many of the events are sold out, there are still many with availability. An event I’m dying to go to, but can’t make work this year, is the dinner at Monteillet Fromagerie near Walla Walla on July 22. Check the OITF schedule and see if there’s a dinner in your area. You’ll be happy you did! There are lots more photos of the dinner here. For a quick look through, select “Options” in the upper right corner and then set the speed to medium or fast.